Are you one of those people who think flossing is not all that important? Well, daily floss should be placed above brushing your teeth in your priority list. It is not just about helping the food morsels entrapped between your teeth let free, but more importantly to wipe off bacteria, dead cells and plaque that adhere to the tooth surface. It is also a common belief that flossing is a difficult task. This again is incorrect. 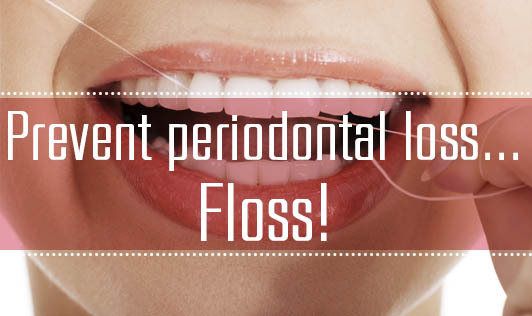 Use an 18inch floss ideally (metered floss is also commonly available), wrap the center along your middle finger to get a firm grip, and hold the floss at your comfort with the remaining fingers. Gently rub it against the surface contours of all your teeth.For those who experience issues with co-ordination due to health conditions like paralysis, Parkinsons, etc; tongs, disposable devices and floss holders are available for assistance. Flossing once a day for about three minutes is ideal. However, flossing must not be a painful experience. Just in case it causes your gums to bleed, it clearly indicates a gum disease. Those who have a periodontal disease may also be advised to use waxed floss, as these are far more thinner, flexible and may cause less pain and flossing difficulty. So high time you get yourself into a habit to floss your teeth every day. Protect your teeth with just those three minutes a day.